Illuminating research on digital distraction epidemic unveiled as provocative video from reMarkable challenges people to "get your brain back"
OSLO, Norway, Nov. 8, 2018 /PRNewswire/ -- A new survey found that society's digital distraction epidemic is deeply impacting our ability to focus and accomplish tasks at work and in our personal lives. The Branded Research Inc.-conducted survey found 75 percent of people admit that digital notifications lead to procrastination and decreased focus, and that individuals waste nearly an entire eight-hour work days' worth of time checking notifications every week. "These findings demonstrate how many of us struggle to remain present in a world that's getting potentially more distracting," said Nir Eyal, an expert on the intersection of psychology, technology and business and best-selling author of Hooked: How to Build Habit-Forming Products. "It is imperative that we adapt our behaviors and adopt new solutions that fix what's wrong with today's technologies." The revealing survey exploring the depth of today's tech addiction comes as reMarkable — a Norwegian-based technology company dedicated to helping people think — launches a compelling video mission statement on the need to "get your brain back" amid a tidal wave of digital distractions. "The destructive global phenomenon of digital distraction is undeniable and must be taken seriously to avoid further jeopardizing our ability to think in a noisy, fast-paced world," said reMarkable CEO, Magnus Wanberg. "It's time we fight back against society's profound addiction and create a more human direction for technology." Since its inception, reMarkable's mission is to deliver technology that helps people think without distractions. By creating a digital experience that keeps notifications at a safe distance, reMarkable's paper-like device allows users to create digital notes that can be easily converted into emails and memos – without interruption from social media, email, browser tabs, and other notifications. 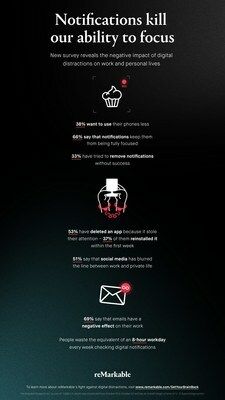 To learn more about reMarkable's fight against digital distractions, visit www.reMarkable.com/GetYourBrainBack. The Branded Research Inc. survey of 1,068 U.S. adults was conducted from October 18 to October 22 and has an overall margin of error of +/- 2.9 percentage points. reMarkable is a Norwegian-based startup changing the way people think and work. Founded amid the growing epidemic of tech addiction, reMarkable created an elegant tool for thinking in the digital age and to serve those who cherish the simplicity and power of working on paper. The high-precision, disruption-free device is an extension of reMarkable's vision to combat digital distractions and revolutionize our ability to focus and remain engaged in an ever-evolving world. Better paper. Better thinking.